Heptio is one of the more interesting companies in the container ecosystem. In part, that’s due to the simple fact that it was founded by Craig McLuckie and Joe Beda, two of the three engineers behind the original Kubernetes project, but also because of the technology it’s developing and the large amount of funding it has raised to date. As the company announced today, it saw its revenue grow 140 percent from the last quarter of 2017 to the first quarter of 2018. In addition, Heptio says its headcount quadrupled since the beginning of 2017. Without any actual numbers, that kind of data doesn’t mean all that much. It’s easy to achieve high-growth numbers if you’re starting out from zero, after all. But it looks like things are going well at the company and that the team is finding its place in the fast-growing Kubernetes ecosystem. In addition to announcing these numbers, the team also today launched a new open-source project that will join the company’s existing stable of tools, like the cluster-recovery tool Ark and the Kubernetes cluster-monitoring tool Sonobuoy. This new tool, Heptio Gimbal, has a very specific use case that is probably only of interest to a relatively small number of users — but for them, it’ll be a lifeline. 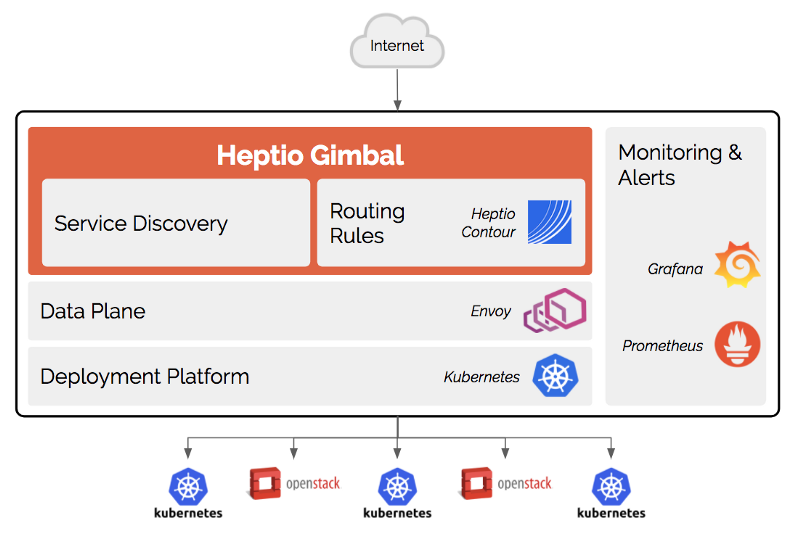 Gimbal, which Heptio developed together with Yahoo Japan subsidiary Actapio, helps enterprises route traffic into both Kubernetes clusters and OpenStack deployments. Many enterprises now run these technologies in parallel, and while some are now moving beyond OpenStack and toward a more Kubernetes -centric architecture, they aren’t likely to do away with their OpenStack investments anytime soon. Gimbal uses many of Heptio’s existing open-source tools, as well as the Envoy proxy, which is part of the Cloud Native Computing Foundation’s stable of cloud-native projects. For now, Gimbal only supports one specific OpenStack release (the “Mitaka” release from 2016), but the team is looking at adding support for VMware and EC2 in the future.